Unfortunately, due to sales rights restrictions, we cannot offer Training the Bodes for sale in your country. By the end of 1971, the hastily raised, poorly trained, and woefully led Cambodian army had suffered a string of defeats and heavy casualties inflicted by North Vietnamese army and Viet Cong units. With many of its best infantry battalions and much of its armour, transport and equipment destroyed, only three of its 15 brigade groups were militarily effective. In South Vietnam, America and its allies were in the process of withdrawing and handing back to the Vietnamese full responsibility for the conduct of the war. A small group of Australians, which never numbered more than 30 officers, warrant officers and non-commissioned officers of the Australian Army Training Team Vietnam, helped train 27 light infantry battalions of the Cambodian army in South Vietnam during 1972. This project was, according to one historical study, 'a classic example of using special forces as a force multiplier', and had been 'recognised as one of the most successful foreign internal defence missions of the Vietnam War'. The story of these few men is told against the background of the war in South Vietnam, and in particular Phuoc Tuy province, as both sides fought to secure villages and hamlets during 1972, before the Peace Accords being negotiated in Paris to end the war were signed. 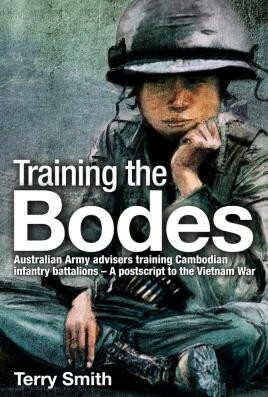 Training the Bodes is an interesting and valuable book that tells a moving story. The excerpts from letters and reports, and the photographs, are fascinating. It fills a small gap in Australia's military history.